Dreams are powerful! Your dream will keep you going: you do have to fulfill your purpose. Yes, they come in handy when the going gets tough! ‘Dreams are necessary to life. 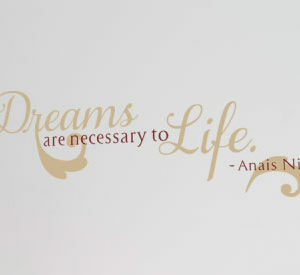 – Anais Nin’ wall words look great above this bed! The white underlying wall is a lovely background for our wall letters. They tie into the rest of the furniture in the room: the headboard, gold colored lampshade and the quilt like duvet. Not only are they an amazing accent, they also help in creating a ‘can do’ attitude. Now that is a wonderful way to start the day! 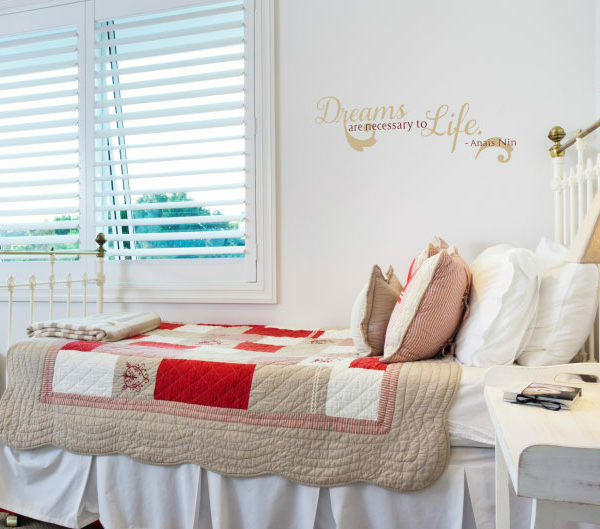 Are you looking for unique wall lettering to jazz up your bedroom? Are you searching for a one-of-a-kind gift? Try WiseDecor products! They are available in different colors styles and sizes. They will fit into your style and wall space! We also specialize in custom wall quotes. This means that you will end up with wall decor that is not commonplace! 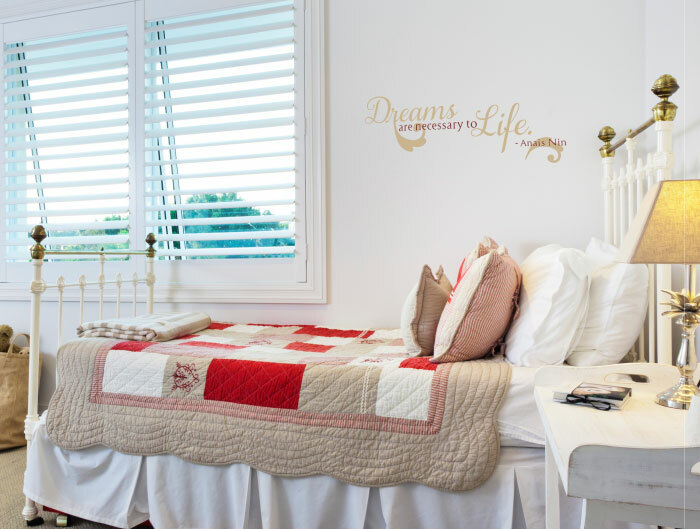 Our wall decals are durable and look as though someone painted them onto the wall surface! Application is very easy. Simply peel the back sheet and paste the adhesive side onto the wall! It is that simple. Our designers are very good at what they do. Quality decor will grace your walls. Have a look at our ‘Moods and Attitudes: Hope and Dream’ category: you will be spoilt for choice! Do call or email. We would love to hear from you!